We live in a world obsessed with junk. Most of that junk sits around collecting dust, breaks down soon after you buy it, or is something we shouldn’t be buying in the first place. The challenge in trying to declutter your house is overcoming the idea that junk holds some sort of special value. We convince ourselves we need said item it and sit on it longer. Don’t believe me? Take it from a recovering packrat that 90%+ of that stuff that’s collecting dust simply isn’t needed. But, it isn’t always as easy to completely change your mindset or toss everything in a few hours. It takes work. I noticed this when we moved near the beginning of the year. We were overwhelmed with stuff and found it took and takes a concerted effort to declutter your home. Thankfully, once you develop a new mindset and start tossing things, it gets easier. 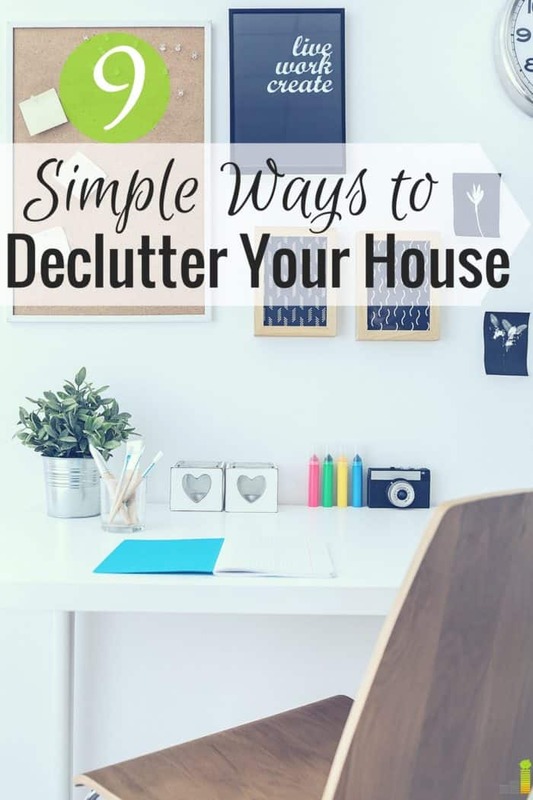 Here are some of the simple ways we’ve found to declutter our house and not always feel swamped in junk. Trying to declutter your house all at once is overwhelming. It’s difficult to know where to start and it’s hard to build any kind of momentum. We prefer to declutter one room at a time as it allows us to clean up our house in bite size chunks. 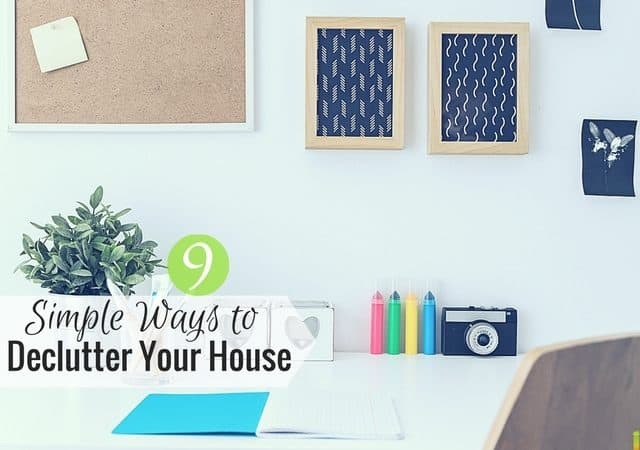 We like to take the room that we feel will take us the least amount of work so we can build momentum toward the ultimate goal of decluttering the whole house. Our pantry was a mess before we moved. Thinking ourselves fairly organized, we were shocked to learn our pantry was a huge mess. There were things in there that were years passed their expiration! It’s not surprising that it was often difficult to find items we actually wanted because there was so much clutter in the pantry. Noticing our frustration at the amount of food waste, our realtor gave us a brilliant idea – well, at least, it seemed brilliant to us. She suggested we put as many items as possible in clear stackable containers. Things like pasta, sauces, cans, etc. could go in your pantry she said, making it easier to organize and stay on top of what we have. We bought these pantry bins from Amazon, and it makes our pantry much less crowded and easier to manage as we can see what we have instead of having to dig through items. You may not believe it, but one of the simplest ways to declutter your house is to cancel cable. The reason is quite simple; you get every product imaginable hawked at you – causing you to spend money and bring more stuff into your home. The more you surround yourself with that, the easier it is to give into the desire to spend. Not that we’re big spenders as it is, but we’ve noticed we spend less since canceling DirecTV because we see fewer ads. We get all of our content from either Netflix or the Amazon Fire Stick, and we save more money every month and have less coming into our home. Mail always seems to be a problem in our home. It’s easy to toss the mail on the island in our kitchen. After several weeks, the stack is completely unmanageable. The fix to this problem is really quite simple – deal with it as it comes in. We go through our mail each day – tossing items we don’t need in recycle or shred piles with bills going to the office to be paid, assuming they’re not on auto-pay. The few magazines we receive get read that month before being tossed into recycling. Following this method allows us to stay on top of our mail and save time in the process. I can’t remember where I read about this decluttering tip, but it’s fairly straightforward. Grab a trash bag, pick a room or go around your house and find items you’ve not used in the last year. If you don’t see yourself using the item in the next month, toss the item in the trash bag. It really shouldn’t take that long to fill the bag. Once it’s full, and assuming all the items are in decent shape, you have a bag of stuff to donate. I’m a procrastinator by nature. I plan to do something, and I find every excuse not to do it. When it comes to decluttering your house, procrastination can defeat your end goal. For example, say you fill five trash bags with items you want to donate. You stick them in the corner of a room, forget about them; weeks pass and you haven’t gotten rid of the items. We’ve learned that if we schedule time that week to donate the items, we greatly increase the probability of them leaving our house. You can even put the trash bags in your car as a reminder to drop them off at your location of choice. How many “junk” drawers do you have around your house? Whatever the number, take each drawer and dump them out on a counter. Take each item and assign it to one of three groups – keep where it is; keep but belongs elsewhere or get rid of completely. Deal with each group independently and you’ll be amazed at how much clutter you’ll obliterate. After I lost 100 pounds, I was amazed to see how many items of clothing I had that were brand new that I had never worn. I’ve read it in numerous places, but experts say we really only wear about 20 percent of the clothes we own. Thus, the closet is one of the easiest targets to declutter. Go through your closet and find items you’ve not worn in several months. Assuming it’s not seasonal, and not something you plan on wearing in the near future then it’s likely you can get rid of the particular item. We go through this exercise several times a year to make sure we really only have items we like to wear on a regular basis. I saved this for last on purpose. The easiest way to declutter your home is to simply stop buying crap. I know it seems difficult. It may seem impossible. It isn’t. You just have to stop buying crap you don’t need. Start doing that and most of the rest of these items become relatively simple to do. Decluttering your home may feel overwhelming or not really necessary. It’s not, and the feeling it creates is freedom. You’re less weighed down by junk around you and have the items you really want in life. If you’re anything like me, you’ll find there’s truly very few things you need to have in life to make you happy. What are some other ways you’ve found to declutter your house? What’s the most difficult area in your house to declutter? How many “junk” drawers do you have in your house? My stuff is always neat, but my kids are hoarders! Fortunately, they will get rid of stuff they’re no longer playing with from time to time. Our oldest is that way as well. She tries to keep everything! I tell myself to put 10 things away each night before bed. It’s become a ritual, but really helps me to feel less anxious and helps to keep on top of the clutter. That’s a good trick. I’d imagine that would make it much easier to manage and stay on top of. Great tips, John! Decluttering is really a constant process for me. I’ll go in spurts a couple of times a year and try to hit one area in the house per day (15 minutes is all it takes!). We don’t buy much “stuff”, but our garage tends to collect all of those things we may need “just in case”. My kids used to keep everything. Now that they are teens, they are so much better about cleaning out! Thanks Amanda! We’ve really moved to doing that as well and it feels so good. We finally got our garage cleaned out over the past few weekend and love the extra space. Ah, that gives me hope. 🙂 Our kids, especially our oldest, is definitely a packrat. Now that we live in an RV, we have almost no clutter. It’s really nice! We made a goal to create a guest bed room that we could host overnight guests or even rent out. This motivated us to clean and declutter most of our lower level, which was definitely our problem area. Having a goal to use the space, be helpful to others, and even make some money, helped us get things cleared and organized much faster. That’s an awesome approach to take on it Kalie, I love it! I try to go through my close once or twice a year, and I love the feeling of getting rid of clothes I don’t wear. I typically gravitate towards just a small sub-set of my clothes, so it makes it easy to regularly get rid of some of them. I’m the same way DC. There’s a small set of clothes I tend to wear on a regular basis, especially with working from home. Seems like everyone caught the decluttering bug at the same time! I agree with all but one recommendation. I recommend going category by category instead of one room at a time. If you sort through all your books, all your clothes, all your skincare products, all your sports gear, etc. at the same time, you’ll rid yourself of more duplicates and find better storage for the things you actually use.